Sit or stand upright. Interlock hands on the back of the head near the crown. 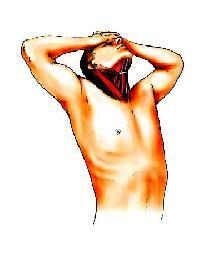 Lightly pull the head straight down and try to touch the chin to the chest. Lesser-stretched muscles: Longissimus capitis, semispinalis capitis, splenius capitis, scalene. You can do this stretch either while sitting or while standing. A greater stretch is applied when seated. Standing reduces the ability to stretch because reflexes come into play to prevent a loss of balance. 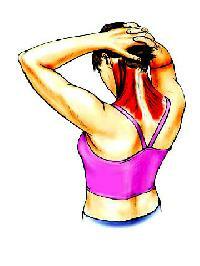 During the stretch, make sure not to reduce the stretch by hunching up the shoulders. Also, keep the neck as straight as possible (no curving). Try to touch the chin to the lowest possible point on the chest. Neck Stretches: "When the neck extensors become flexible, progress from stretching the right and left sides simultaneously to stretching the opposite sides individually." Sit or stand upright. Place the right hand on the back of the head near the crown. Pull the head down toward the right and try to touch the chin as close as possible to the right shoulder. Lesser-stretched muscles: Left longissimus capitis, left semispinalis capitis, left splenius capitis, left scalene. Sit or stand upright. Interlock hands and place the palms on the forehead. Pull the head back so that the nose points straight up to the ceiling. You can do this stretch either while sitting or while standing. A greater stretch is applied when seated. Standing reduces the ability to stretch because reflexes come into play to prevent a loss of balance. 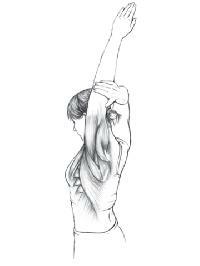 During the stretch, make sure not to reduce the stretch by hunching up the shoulders. Also, try to point the chin as far back as possible. Neck Stretches: "When the neck flexors become flexible, progress from stretching the right and left sides simultaneously to stretching the opposite sides individually." Stand or sit upright. Place right hand on the forehead. Pull the head back and toward the right so that the head points toward the shoulder. Keep the head straight; do not lay the head down to either side. Lesser-stretched muscles: Left longissimus capitis, left semispinalis capitis, left splenius capitis. Stand upright while facing a doorway or corner. 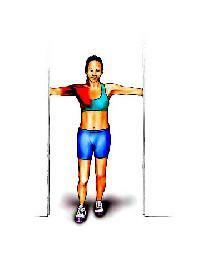 Place feet shoulder-width apart with one foot slightly in front of the other. With straight arms, raise your arms to shoulder level and place the palms on the walls or doorframe with the thumbs on top. Lean the entire body forward. Most-stretched muscles: Pectoralis major, anterior deltoid, coracobrachialis, biceps brachii. To get the maximum benefit during the stretch, keep the elbows locked and the spine straight. The greater the forward lean, the better the stretch. Forward lean is controlled by how far the lead foot is in front of the chest at the start position. Hence, place the foot forward only enough to maintain balance. 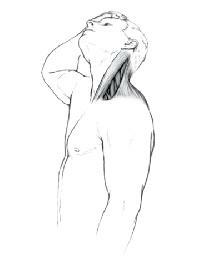 It is possible to do the neck extensor stretch simultaneously with the shoulder flexor stretch. However, without having the hands pushing down on the head, the neck extensor stretch will be of a lower intensity than if it were done by itself. Stand upright inside a doorway while facing a doorjamb with the doorjamb in line with the right shoulder. Place feet shoulder-width apart with the toes pointing straight forward. Bring the left arm across the body toward the right shoulder. Pointing the thumb down, grab hold of the doorjamb at shoulder level. Rotate the trunk inward until you feel a stretch in the posterior left shoulder. Most-stretched muscles: Left posterior and middle deltoid, left latissimus dorsi, left triceps brachii, left middle trapezius, left rhomboids. Lesser-stretched muscles: Left teres major, left teres minor, left supraspinatus, left serratus anterior. To get the maximum benefit of this stretch, you should keep the elbow locked. Over time, as the muscles become more flexible, to keep the elbow locked you will need to grasp the doorframe above the level of the shoulder. Raising the height of the hand does not diminish the major benefits of this stretch. However, as the hand gets higher above shoulder level, the stretch on the rhomboids decreases while the stretch on the serratus anterior increases. Stand upright with the feet shoulder-width apart. Bring the left arm across the front of the body, with the left hand near the right hip. With the right hand, grab hold of the left elbow. With the right hand, try to pull the left elbow down and around the right side of the body. 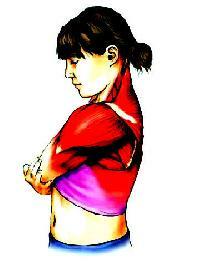 Most-stretched muscles: Left posterior deltoid, left latissimus dorsi, left triceps brachii, left lower middle trapezius. 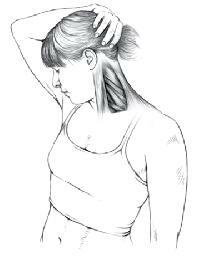 Lesser-stretched muscles: Left teres major, left teres minor, left supraspinatus, left levator scapulae, left rhomboids. To maximize the stretch, do not raise the shoulder or bend at the waist. If it is not possible to bring the hand toward the hip, try to come as close as possible. 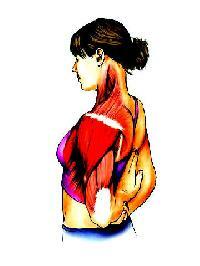 As long as the arm is below the shoulders, the stretch will be effective for the stated muscles. Shoulder, Back, and Chest Stretches: Bringing the arm above the shoulder changes the emphasis of the stretch to the elevators and protractors. Stand upright with the feet shoulder-width apart. Raise the left hand high above the head, and bring the left arm up against the left side of the head. With the right hand, grab hold of the left elbow. With the right hand, try to pull the left elbow behind the head, past the left ear. Most-stretched muscles: Left posterior deltoid, left latissimus dorsi, left triceps brachii, left lower trapezius, left serratus anterior. Lesser-stretched muscles: Left teres major, left teres minor, left supraspinatus, left rhomboids, left pectoralis minor. Stand (or sit on a backless chair) upright with the left arm behind the back and the elbow bent at about 90 degrees. Place feet shoulder-width apart with the toes pointing forward. Grasp the left elbow with the right hand. 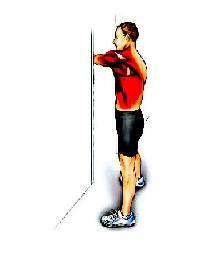 Pull the left arm across the back and up toward the right shoulder. Most-stretched muscles: Left pectoralis major, left anterior deltoid, and middle deltoid. Lesser-stretched muscles: Left levator scapulae, left pectoralis minor, left supraspinatus, left serratus anterior, left coracobrachialis. If you cannot reach the elbow, then grasp the wrist. When pulling on the wrist, it is easy to pull the arm across the back, but remember that the best effect comes only from pulling upward as well as across. Also, keep the elbow locked at a near-90-degree angle. Changing the alignment of the back will also influence the magnitude of the stretch. If you cannot keep the back straight, arching the back is preferable to bending at the waist. Just be careful; it is easy to lose balance when doing this stretch while both arching the back and standing up.